I’ve been a personal trainer now for about three and a half years. 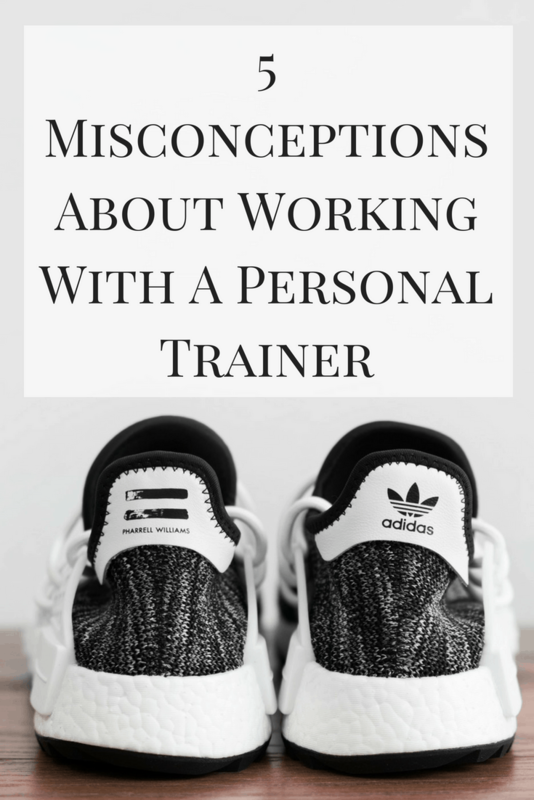 I’ve gone through a lot of ways to use that title, from teaching to freelance writing about fitness to training individual clients, and in that time there are a few misconceptions that have come up. I think that everyone deserves to live their healthiest lives, and if any of these are holding you back from considering working with a trainer, I’m here to clear them up with you. Although I’ve been working with most of my current clients for at least a year or more, that doesn’t need to be the case. I’ve worked with clients for a finite period of time in order to help them reach specific goals: enough confidence to jump into a group fitness class, wanting to learn how to work out on their own, etc. You’re in control of how long you see a personal trainer, from how many days a week to how long in total. Although there are a fair share of trainers who like to motivate with loud noises, there are also those who like to sing songs of encouragement (raises hand). The important part about working with a personal trainer is to find one that you mesh well with. Since a good relationship can also result in training sessions becoming almost mini therapy sessions (if that’s your thing), try out as many trainers as you need to in order to find the right fit. If you want someone to yell at you, there’s someone there. If you need someone to be more gentle, they’re there for you as well. Just do a little research and ask questions before you get started. Remember, this is for YOU, so don’t feel bad if the first trainer you try doesn’t work out. It’s true that personal training can get expensive, but that’s another thing you have partial control over. Training prices have a wide range, so it’s important to do some research into trainers in your area. A lower priced trainer doesn’t necessarily correlate with a bad trainer, just as a high priced trainer may not mean they are the best. Think about different variables that could make training more affordable for you: only seeing them once a week while working out on your own other days, paying in installments, etc. Think outside the box for ideas to propose that may benefit both of you – maybe you could refer x number of clients for a break in price or something similar. Always be willing to have a conversation; it doesn’t hurt to ask! I wish exercise was the most important part. That would make eating all the delicious brownies and donuts that I do almost inconsequential. Unfortunately, your diet is hugely important in how effective your exercise really is. I can notice it almost immediately if what I’ve been eating has been less whole foods and more junk. My workouts suffer, my endurance is wiped, and visibly there is a physical difference. Legally, trainers are not allowed to prescribe nutrition advice outside of the very general. They can tell you about the importance of different macronutrient groups (proteins, carbs, fat), but giving clients detailed plans is outside the scope of our practice. That doesn’t mean that trainers don’t do it, but don’t expect that with every trainer you see you will also get a breakdown of exactly what to eat and when. If a client of mine has detailed questions, I refer them to a dietitian who has far more education in that field. Although I love food and have a good deal of knowledge about it, I don’t feel comfortable advising in a practice I don’t actually work in. Are there any of these that I may have missed? Let me know your thoughts in the comments and I’ll be sure to address them! What misconceptions do you have about working with a personal trainer? Let’s clear them up here. Ooh, I hope you’re right that working with a personal trainer isn’t always expensive! I’ve never been able to find one who’s reasonably priced… maybe it’s the scene in Hong Kong?